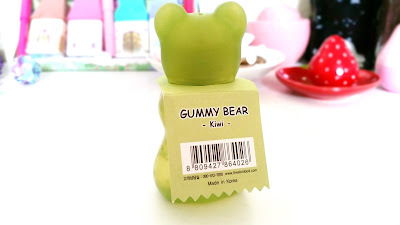 Today is all about this Skinfood Gummy Bear Jelly Hand Gel in Kiwi. We purchased 3 products from Skinfood's Gummy Bear Jelly hand care product line and this Jelly Hand Gel in Kiwi was 1 of them. 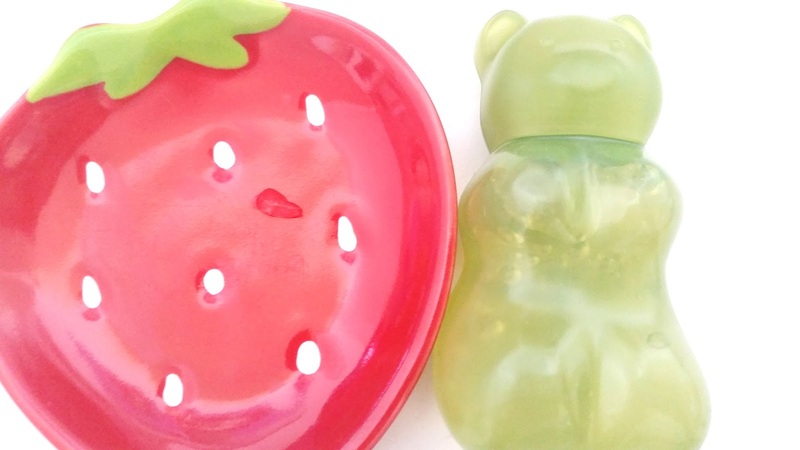 The other 2 are Gummy Bear Jelly Hand Cream in Grape and Gummy Bear Jelly Clean Gel in Apple. We got 3 different kinds to try out the variety they offer and it's definitely been interesting so far. Mainly because what we thought we would like the most came up just a little short and what we weren't so sure about out came out on top. 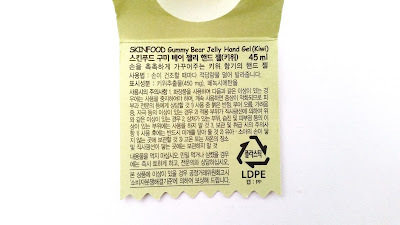 Anyways, let's get to know this Skinfood Gummy Bear Jelly Hand Gel in Kiwi. Product Description: A Kiwi scented hand gel formulated to moisturize the hands. The hand gel is lightweight and provides fresh and clean feelings. To Use: Take a good amount of the hand gel and apply it onto clean hands. Reapply when needed. Packaging: Adorable as always. 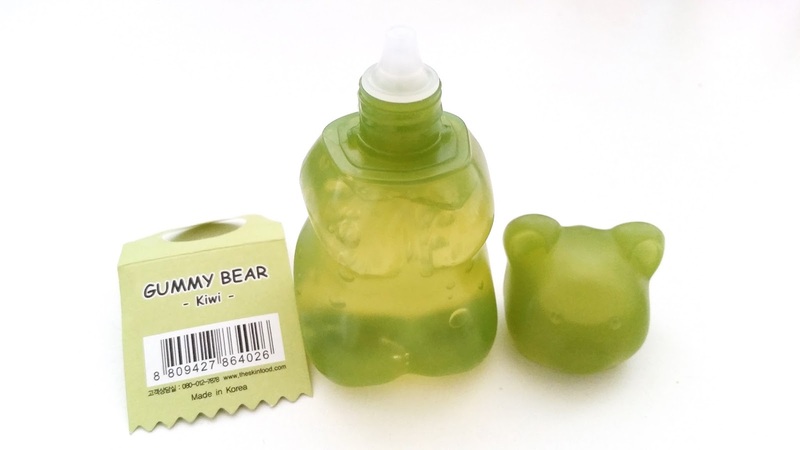 These Gummy Bear Jelly hand products resemble gummy bears well and are travel friendly too. 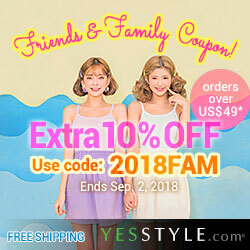 We love the design. 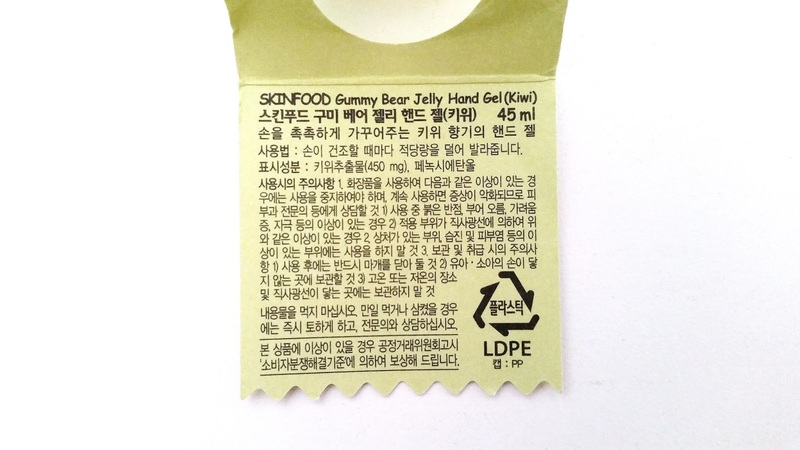 Each gummy bear hand product comes with a small tag that includes some information regarding the product in Korean. (We wish it came with information in English.) The hand gel is stored in a squeeze bottle with a twist-off lid. Scent: The Jelly hand gel smells like kiwi. It's a bit artificial and on the light side too, which was a bit disappointing for us. We wish for a bit more kiwi scent. Color: The hand gel is clear. Texture: It feels like any gel product would. It's not too thick, as it comes out of a squeeze bottle with a small opening. The hand gel has about the same texture as a hand sanitizer. 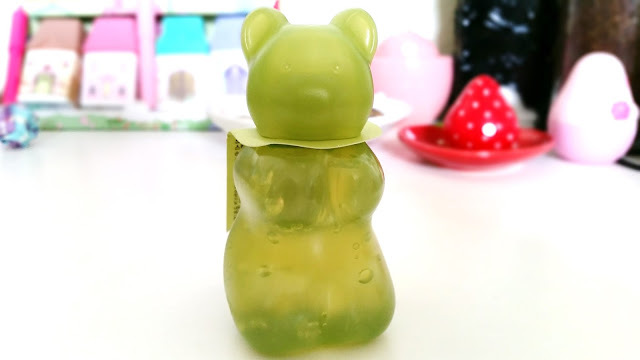 Our Thoughts: We thought we would like this Skinfood Gummy Bear Jelly Hand Gel the most out of the 3 gummy bear hand care products we got from Skinfood. However, the hand cream in Grape turned out to be our favorite and this came in second. The downsides of it knocked it down a few level for us and it was a bit disappointing. The main downside is that the hand gel is not as moisturizing. It takes a lot of hand gel to get the same moisture level as a hand cream would. However, if you use enough, it can start to feel sticky and take a long time to absorb. We purchased the hand gel thinking its light consistency would feel refreshing while its formula provides moisturizing effects to the hands. However, the hand gel doesn't moisturize well and while it provides a refreshing feeling, it can leave a sticky feeling while the product is bring absorbed. The packaging was the whole reason why we purchased this hand gel and we are a bit disappointed by the hand gel itself. While the product has some positives, it also has quite a few negatives. The hand gel is travel friendly though and it has a light formula. This hand gel might work better for summer times but it's definitely not for winter times unless you don't need the moisture. Final Thoughts: Although the Skinfood Gummy Bear Jelly Hand Gel didn't turn out as awesome as we hope it would, it's still pretty decent. There's a few set-backs but we know we'll end up using it all. Will we repurchase it again in the future? In kiwi, probably not. However, we might try the other scented Jelly Hand Gels. We have our eyes set on Raspberry actually. Do we think it's worth a try? That depends. If you are looking for a lighter consistency hand product that offers decent moisturizing effects and comes in a cute gummy bear container, then it's worth it to give it a try. Disclaimer: This product was purchased by us. All opinions are honest and our own.